Scotland is a country steeped in history and legends. Much of Scotland's ancient history has been lost to us, as in these earlier times, there was no written language to preserve the ways of Scotland. Apart from a few chards of pottery or the odd tool or weapon, we essentially have no knowledge of the culture of Scotland in those historical times. If it were not for the Roman invasion of about 1500 years ago, we would know even less about Scotland's history and legends, as most of our knowledge of Scotland begins with the Roman writings about a conquered Scotland. "Scotland, I imagine, has launched more voluntary exiles from her shores and borders than almost any other country of the Western world. And, as someone has rightly said, "there's nothing like exile to endear one to a place." Which is no doubt why more Hymns to Caledonia have been written by the banks of the Nile or the Murrumbidgee than were ever penned by the bonnie banks of of Clyde; and why there are more hearts beating for love of the Highlands, in the far distant places of the world, than were ever within cooee of Culloden or Loch Maree or the Western Isles." Bill Wannon, The Heather in the South, 1966. To be exiled from Scotland refers not only to those exiled as such, but to those forced to leave due to the industrial revolution, poverty and those seeking a better life. Even after 200 years of settlement in foreign lands, we who are distant to Scotland's shores, still feel an attraction to her, a sense of belonging. Some of us feel that the old Scottish values on family are far superior to what we find now, being made in times when invasion was always onhand or just a step from us. Scotland's people knew the true purpose and value of family, and we can learn much from those old ways. Most of us will never return to Scotland, although we might like to. Todays Scotland is not the Scotland we romanticize about - demolished castles harken us to a bygone age of continuous warfare, threat of warfare and little peace, but todays Scotland does not seek separation from the United Kingdom, it's values now reflect a peacetime and continuous English dominance of 200 to 300 years. This site is for those of us who still wish to touch roots with the Scotland of our ancestors, or those who may want to see a side to Scotland other than dry and dreary words found in modern history books. Thistle is a common name for several thorny, herbaceous plants which usually have yellow or purple flowers. The Scottish Thistle propagates through fluffy thistledown that can frequently be seen floating on the wind in the right season. Thistles generally also produce a thick taproot, which people can eat or use as a substitute for coffee. However, one thistle in particular, Onopordum acanthium, stands above all the rest as the national flower of Scotland. It's the thistle that most people think of when imagining the family as a while, and remains one of the most beloved symbols of Scottish nationality of all time. Prickly thistle is the oldest flower in this family and has been the national emblem of Scotland for centuries. Prickly thistle is present in pastures and fields throughout Scotland, but can and has thrived anywhere it can set down root. The long, savage spines cover the plant like armor plating, as anyone who's ever tried to pick one is well aware. Its earliest use as a regal symbol was on the silver coins brought out by James III in 1470, but the esteem the Scots hold it in go back much farther. Scotland was under continuous attack by Vikings from 795. Scotland, along with Ireland, was particularly prone to attack by Vikings because of the number of literary and religious treasures moved and sheltered in Scotland to preserve those treasures from the wars after the fall of the Roman Empire. For hundreds of years a major part of Scotland even belonged to the Kingdom of Norway, and the attacks did not cease even after Norway as a country accepted Christianity. The Western Isles were not returned to the Scottish rule until 1266 and have remained a disputed point until quite recently in history. However, by 1263 Norway again started taking stock of its former territory, which when King Alexander the Third presented a formal claim on both Kintyre and the Western Isles to the Nordic King Haakon the Fourth. This offer was rejected by King Haakon, who responded by mounting an invasion, culminating in the Battle of Largs. King Haakon of Norway planning to conquer the Scots, left with a large convoy of long ships towards the Scottish coast. Fierce storms and gales prompted some of the long ships to alight on the beach at Largs in Ayrshire. According to legend, at some point of the attack, the Norsemen attempted to astonish the resting Scottish Clansmen. The Norsemen took off their footwear to move more quietly under the cover of darkness. However, as they sneaked barefooted they unfortunately came across a patch of ground full of thistles. As a result, one of Haakon's troop men accidentally stepped on one and yelled out in pain, thus warning the Scottish warriors of the advancing Norsemen. The Scottish warriors promptly responded, sparing Scotland from invasion and leading to eventual negotiations returning the disputed territories to Scottish rule. 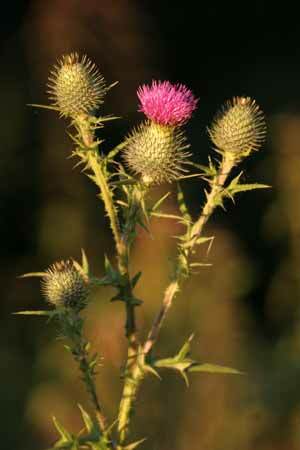 Thus, Scotland chose the Scottish thistle as its national emblem. Haakon died while returning to Norway and the Treaty of Perth was established shortly thereafter. Another legend assigns the renowned King Achius with the adoption of the Scottish thistle as a national symbol, but the documentation on this legend is highly suspect, as it references events that happened centuries apart. Achius supposedly founded the Thistle's Order in the ninth century, restricting the order to thirteen knights to reflect Christ and his Twelve Apostles. The Order has had a spotty history, but the current official order was instituted by James VII in 1687, and revived after a period of dormancy by Anne in 1703 and is currently residing in the St. Giles Cathedral at Edinburgh. It's current maximum is sixteen members, having increased under George IV. The Knights' motto 'Wha daur meddle wi me' is interpreted as 'No one harms me without punishment'. Scotland as a nation uses this motto in its Latin form, "Nemo me impune lacessit," literally, "No one provokes me with impunity," a fitting phrase to accompany this thorny, tough and resilient flower and nation. We have now amalgamated two of our web sites here. Which means there is a ton of information on Scotland's history and legends. Under the Urquhart category, you will find several web pages - one on the Urquhart castle today with lots of photo's and pictures, another on the historical role of Urquhart castle in Scottish history and, one on the Urquhart Clan of Scotland with lots of pictures and photos too. Under the Scottish Heraldry topic we briefly explain how to join an existing clan of Scotland - if your eligible to do so. If not, you may be able to follow the directions and start your own Scottish clan, even if you don't live in Scotland. "Urquhart and Glenmoriston" covers, as the name implies, the Urquhart and Glenmoriston lands in Scotland; in some places it refers to all of Scotland. This is a very accurate copy of the book "Urquhart and Glenmoriston by William MacKay" which you can now find here, with one web page equal to one full chapter. This is turning out to be a much bigger job, as the level of accuracy I want is now slowing down the progress. As of April 17, 2007, it looks like it will take at least several more months to complete Urquhart and Glenmoriston and have it up and running in it's new improved form, with spelling errors etc created by the duplication process corrected as well. It's now 2008, the book has been almost finished, apart from minor problems. Further, we have made the book, Urquhart and Glenmoriston by William MacKay, fully text searchable. Be aware that " Urquhart and Glenmoriston " appears to contain words from several foreign languages, such as old Persian, as well as the original Scottish language, Gaelic, as well as older type spellings of english words - so searching may not be so easy. Normally Mr William MacKay provided the translation with the text when a foreign language was used. The Urquhart and Glenmoriston book, has become much more friendly search wise. The search will identify the most likely topic/s for you to visit, then on loading that topic of Urquhart and Glenmoriston, you could then use the search feature in your web browser to find your search words on the page! Anyway the chapter format now covers the Urquhart and Glenmoriston book, replacing the one book page for one html page format, which turned out to be slow and tedious. Urquhart and Glenmoriston by William MacKay is a very colorful and entertaining history book on the local history of the Urquhart and Glenmoriston area of Scotland.
" Urquhart and Glenmoriston " covers everything from the early legends and fairy tales, to the battles and wars, to the introduction of education and schools in the Urquhart and Glenmoriston area. In case you don't know, William MacKay was the grandson of a Scottish highlander sentenced to banishment in Jamaeca for his support of the line of Scottish Kings. His grandfather escaped and made his way back to Scotland under a different name. If you want history up close and in your face, this is a book well worth reading. " Urquhart and Glenmoriston " has given me many hours of pleasurable reading so far. Once picked up, " Urquhart and Glenmoriston " is very hard to put back down. Urquhart and Glenmoriston is also disturbing to read at times, as one can feel or empathise with, the events happening. If one considers these names to be blood kin it seems to get more personal too. This hunting book on the wild sports and natural history of the highlands was written by a seasoned hunter, Charles St. John, in 1849. It covers the hunting techniques, amongst other things, that were used in the Highlands of Scotland, but it also describes in some detail the life and habitat of the animals he hunted, plus other animals he didn't hunt. This Scottish hunting and wildlife book is an interesting hunting book on a side of Scotland many of us know little of. Although it may seem strange that a hunter would be writing a book on the wildlife of the Scottish highlands, his ability to hunt was very much based on his exacting knowledge of the species he hunted. He also was aware that some species were beneficial to the Scottish highland farmers and city dwellers, such as the owl hunting rats and mice. I became interested in this Scottish hunting book, because of Conachar's fight with the man killer boar that I read about in the book on Urquhart and Glenmoriston, where the spear just bounced off the thick hide of the boar and Conachar nearly lost his life. I wanted to have some insight into hunting and the dangers thereof in the Scottish highlands. It's not a history orientated book of Scotland like "Urquhart and Glenmoriston", it's Charles telling his personal account of his hunting life in Scotland, which he had made notes of over many years. How dangerous was hunting in bonny old Scotland? History tells us hunting was very dangerous. To give but one hunting incident Mr. St. John gives in his Scottish hunting book - a wild, feral cat ( a Wild Scottish Cat - not a domestic cat gone wild) was cornered in a hunt by his hunting dogs. With nothing but a stick, Mr. St. John approached. The cat jumped over the hunting dogs straight for his face, if it had not been for his stick and quick reflexes, he would have been badly scarred or killed by the cat. The other interesting part to this is that Mr. St. John had stepped on the cat by accident as it rested in it's lair - he had just been walking along a Scottish trail. So, even the Scottish Wild Cat was deadly when wild in the highlands of Scotland. Scotland was very dangerous to live in and afforded many hiding places for animals that liked to hunt. The Urquhart and Glenmoriston area of Scotland was no exception. Several hunters died trying to kill that boar that nearly killed Conachar. Scotland's story was a set of - truish - historical stories about Scotland and her people. Written after the English had tamed Scotland, the writing contains an almost apolegetic note at times, pointing out some modern Scottish people and their contribution to the benefit of England. Still, if you want an easy to read version of what Jacobites are, or an understanding of something Scottish, then Scotland's Story is the book that may help. Yes, even two hundred years ago, preachers were complaining about church life lacking spirit and life, being dead. Duncan Matheson could see this in the churches of Scotland, faced reproach from the church for trying to be different. What did he succeed in doing? Setting fire to the Christian church in the spiritual sense. His means may seem macabre by even todays standards. He travelled with a friend seeking God's power. Laying on graves of the Saints and crying out for God with tears and great emotion. Do that today and you'll possibly find yourself carted off to the funny farm. BUT God heard and was touched and He empowered Duncan Matheson to set the churches and people of Scotland spiritually on fire for God. If you are a Christian today, you can possibly learn much about the earnest desire to please our Heavenly Father and how He then accepts the challenge. Don't believe in God? Well, see what a believer can do to influence an entire country - Scotland. A detailed history of Scotland, but it does have some big web pages - some around 250kb in size. Volume 2 of Tytler's History Of Scotland, which covers 1390 to 1542 AD. Scotland's History and Legends is out of Beta stage. Our Indexes have been vastly improved, we are working through some of the errors we have found in the duplication technology. Scotland's History, Legends, Wildlife and Hunting Practices has turned out to be a very much bigger project than we first realised. When the all up cost went past $1000 for just one book - Urquhart and Glenmoriston - I was stunned. The labour content of the Urquhart and Glenmoriston project has now exceeded 200 man hours and is still going - it's the price one pays for accuracy. Sad part is, most search engines wont direct many people to it, as the book is not keyword rich. I was also very dissappointed to see the original book "Urquhart and Glenmoriston" badly damaged through the duplication process. I'm Scottish by ancestry and love the history and legends of Scotland, in fact just about anything to do with Scotland for that matter. Much has been lost and or forgotten about the old ways of Scotland, but this is one way of preserving the History and Legends of Scotland in a way that allows every one free access to this beautiful country. 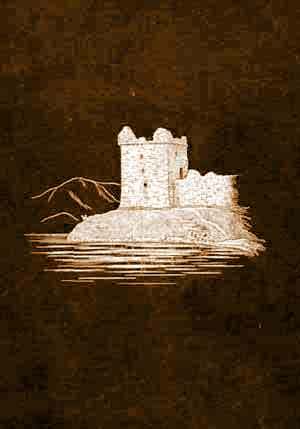 Our entertaining and accurate web site may also be of interest to those interested in Clan Urquhart or in starting their own clan up - it also covers more current events, such as the super volcano which is threatening to errupt under the Great Glen to the Highland Warrior Ghosts that still fight out the last Jacobite uprising. More than just a history site, it's about the mystery and love of Scotland as well. Donald Urquhart, Australia, January 5th, 2008. Some sections research and written by Loni Ice.